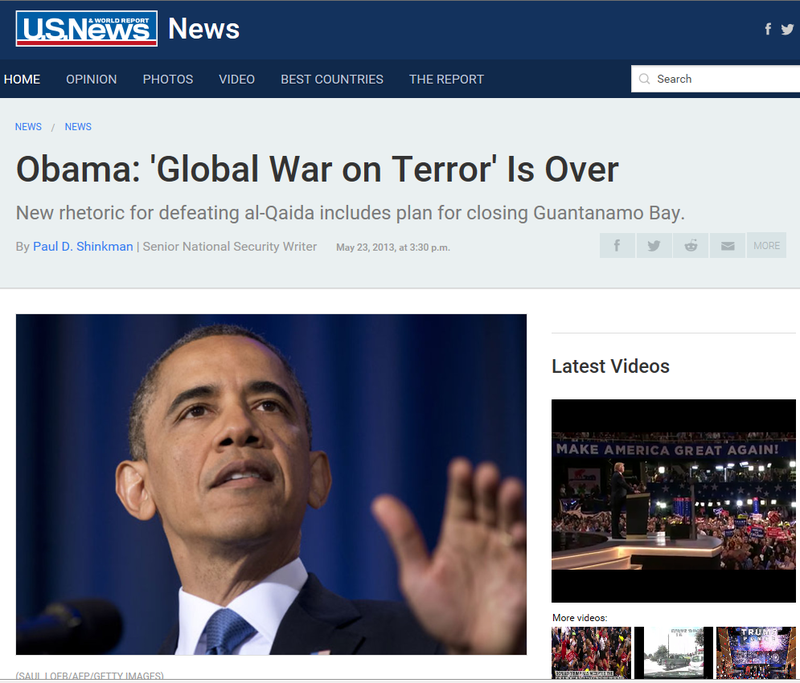 The most strategically critical American ally in the war on global terrorism is gone, having announced his resignation today. Coming on the heels of the Russian invasion of Georgia – and the resulting reawakening of tensions between former superpower rivals, this news further escalates the awareness of the stark realities of the 21st century. And it will all-too shortly be followed by Iran – protected by Russia from international sanctions – developing a nuclear arsenal. It might be a good development for Pakistan, but I believe time will prove that it is a bad one for the United States and for those who would fight to defeat the rising threat of Islamic terror. ISLAMABAD, Pakistan – Pakistani President Pervez Musharraf announced Monday that he will resign, just days ahead of impeachment in parliament over attempts by the U.S.-backed leader to impose authoritarian rule on his turbulent nation. “I hope the nation and the people will forgive my mistakes,” Musharraf said in a televised address, much of which was devoted to defending his record and refuting criticisms. Musharraf dominated Pakistan for years after seizing power in a 1999 military coup, making the country a key strategic ally of the U.S. by supporting the war on terror. But his popularity at home sank over the years. While political exit robs the West of a stalwart ally, Musharraf’s influence has faded since he stepped down as army chief last year. Washington and European capitals will hope his removal will let the civilian government focus on terrorism and the country’s economic woes. Many Pakistanis blame the rising militant violence in their country on Musharraf’s alliance with the U.S. His reputation suffered blows in 2007 when he ousted dozens of judges and imposed emergency rule. His rivals won February parliamentary elections and have since sought his ouster, announcing impeachment plans earlier this month. Protesters took to the streets of Lahore to denounce President Pervez Musharraf over the wave of jihadi suicide attacks, labelling him a “dog” and a “pimp” for his policies against the militants that have provoked the violence. And now the Pakistani government is free to continue its new policy of compromise and appeasement with terrorism unabated. Some articles essentially present a sterilized, optimistic account of how this new policy of “negotiation” will alleviate the terror threat. Not surprisingly, the Taliban and its leaders feel freer to issue — and enforce — such strictures in the area that Pakistan has all but conceded to them. Nor has it bought any peace for the residents of Waziristan and NWFP. AFP reports that “activities” against hair salons and music stores have increased since the military has stopped its operations against the Taliban. Sovereignty requires a government to exercise its authority over that of militias and renegades. The abdication of those responsibilities in Waziristan and NWFP calls into question whether these territories can actual be considered Pakistani. That was one of the underlying principles of the Bush Doctrine after 9/11, and why Pervez Musharraf always understood that he had to at least give some effort in fighting the Taliban and al-Qaeda in these regions. Otherwise, the US could consider Pakistan as having withdrawn from the area and our hot-pursuit needs would then take precedence. The new Pakistani government has obviously not learned much of the lessons of appeasement since the 1930s. If they continue to refuse to recognize the danger of their policy and allow these lunatics loose in the frontier regions, the US has to make clear that we do not consider ourselves bound by that decision. And that is precisely true. If these terrorists are not killed or defeated, and if they do not disband or renounce their extremists views, then how can anyone believe that they will somehow go away? They will continue to remain in their strongholds, continue to fester like the cancers on humanity they are, and will continue to grow in strength until the weak, corrupt national governments are no longer able to contain them. As Morrissey points out, most of these “negotiations” are already completely empty. The increasing unrest in Afghanistan is not the failure of American troops; it is the failure of Pakistan to effectively deal with the Taliban forces infesting the border regions. Musharraf had to negotiate with them when he was weakened by domestic political turmoil; and now a “Democratic” government that is split between rival factions will be in an even more weakened position. The Taliban will undoubtedly take this opportunity to spread their ideology both within Pakistan and into Afghanistan. Perez Musharraf was a tough leader, even a dictator. But it takes a violent man to deal with violent people, and too often we are seeing that Islam represents the deification of violence. Giving bad people the right to vote doesn’t lead to good consequences simply because they are part of a “democracy” now. They are merely free to exercise their power to choose and support evil policies. We’ve already seen that in the Palestinian territories, which used their “democracy” to elect hard-core terrorist organization Hamas. The founder of Christianity was Jesus of Nazareth. He told his followers to put away their swords. The founder of Islam is Mohammad. He taught his followers to take up their scimitars. The literal-historical exegesis of the Bible leads to peace; the literal-historical exegesis of the Qu’ran leads to submission by any means necessary. Mohammad was involved in dozens of military campaigns, during which he ordered acts of great violence. He had over twenty more such campaigns planned at the time of hid death. Dr. Samuele Bacchiocchi builds a case based on study of history, the Qu’ran, and the Ahadith to demonstrate that Mohammad progressed through four stages on violence, beginning with when his followers were few and weak and progressing as they became more numerous and more strong. Stage Four: Offensive War is Commanded Against the Pagans, Christians and Jews. The Muslims of today are clearly increasingly progressing toward their “highest” stage. The terrifying truth is that as Muslims are becoming more “Muslim,” they are becoming more violent. How does compromise with people who are determined to kill you and destroy your freedoms and your very way of life work? I end with this: Dinah Lord’s blog had a counter. 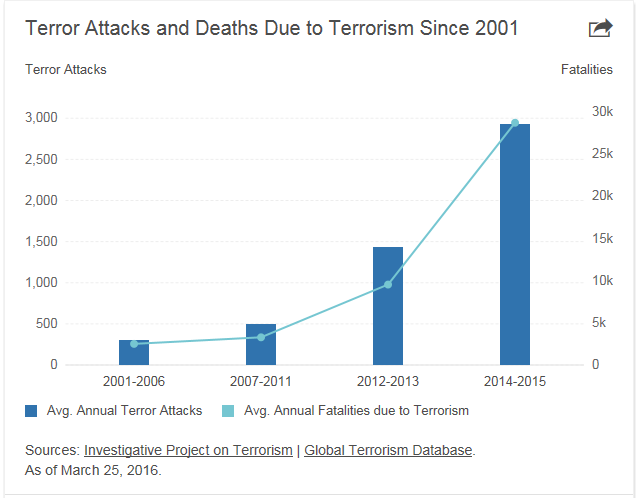 Islamic terrorists have carried out more than 11671 deadly terror attacks since 9/11. The American way of life has often been stated as “Live free or die!” Islamic terrorists are only too happy to grant us the second condition if we attempt to pursue the first.